The Duetto (all models) has the rotary pump above the motor. At some point the pump will begin to leak and has the potential to damage the motor if not replaced in a timely fashion. The pump on the Duetto should be checked on an annual basis as part of the service routine. 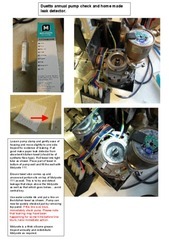 This short PDF will explain how to do this check and how to build the home made leak detector. Please ensure you don't put too much molycote in the pump well, and you must NEVER cover the weep hole on the pump/motor housing (that's the hole you insert the paper into). There are also solutions that would involve drilling a lower weep hole, but this should only be attempted by those with the proper tools and engineering experience. The Molycote may help prevent water going into the motor for a while, but it must be inspected on an annual basis..